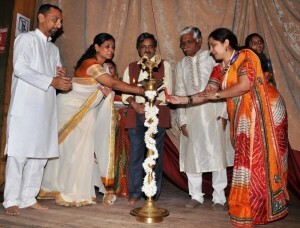 Nrithya Bharathi festival held at Aurangabad on 15th August, 2014. 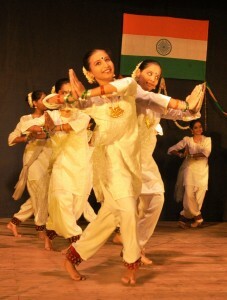 A fifth edition of “Nrithya Bharathi” festival conducted by Natyasaraswathi, Bangalore in collaboration with Devmudraa, Aurangabad was a unique tribute to the country’s vibrant culture and heritage on the occasion of 68th India’s Independence at Tapadia Natya Mandir, Aurangabad. Bharatanatyam, Kuchipudi, Mohiniattam, Kathak, Manipuri, Sattriya and Odissi artists of various origin presented their traditional numbers commencing opening dance by students of Devmudraa a movement school, Aurangabad. 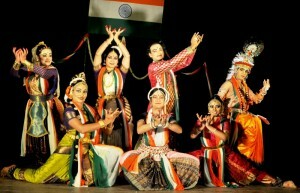 The artists of the evening presented scintillating numbers in all classical dances of India. The most exciting part of the festival was finale “Vandemataram” tribute sung by 25 singers, which was presented by all the seven classical dancers. Music courtesy was by Band stand Qyuki from Bangalore. The Festival is conceived by Dr Saraswati Rajathesh, Director, Natya Saraswathi, Bangalore. 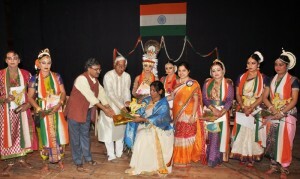 The rasikas of Aurangabad appreciated the unique idea of travelling festival in the form of tribute to Independence day and applauded the efforts of Dr. Saraswathi Rajathesh.